Pool party! 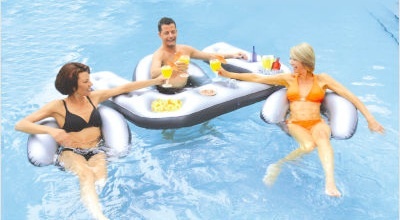 Get your drink on in the pool with the Excalibur Floating Bar and Chair the coolest way to get your buzz on this summer. This floating bar has spots for up to 6 drinks and chip and dip bowls (I guess that wait 30 minutes after eating before swimming thing doesn’t apply, right?) The corner compartments can hold ice and pitchers. Now it’s a a party. Comes with one floating chair, matching chairs sold separately (same link).